Hey guys, listen up. There is a new restaurant in town! You know how we all love our Nandos and the occasional Wagamamas. Well we need to start adding a new place to that list, it’s called Handmade Burger. 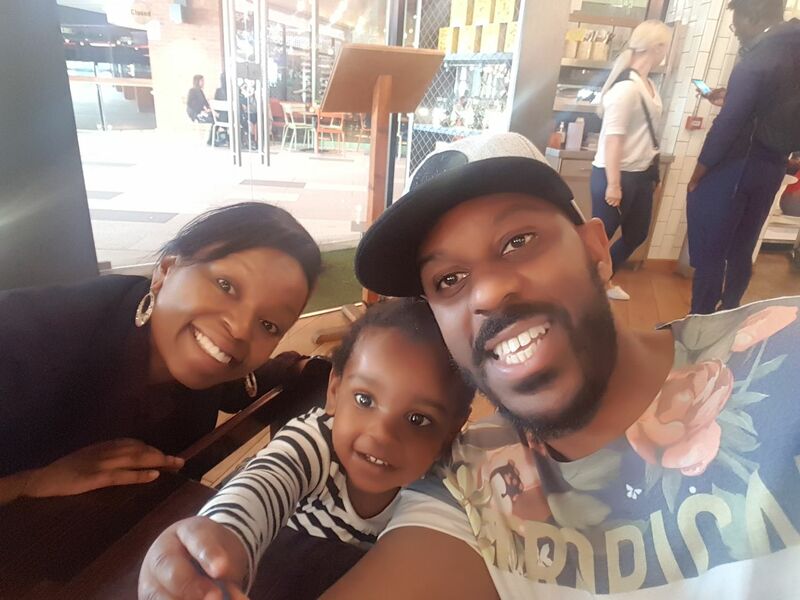 I took the family along to the Wembley branch to sample the food and atmosphere and let you guys know the deal. What a hard life aye, eating and drinking for the sake of research, doing my bit for the good of my fellow family man, ensuring you spend your hard earned cash on good service and good food loool. We arrived on a Friday at 6pm and was greeted by some very friendly staff who showed us to our seat and made us feel at home and at ease. The vibe was cool and chilled, perfect for my toddler who hadn’t napped all day lol. I was looking forward to eating at Handmade Burger because of the large range of options for people with allergies. Our daughter Eleni has wheat and diary allergies so it’s sometimes difficult to find things for her to eat when we go out. 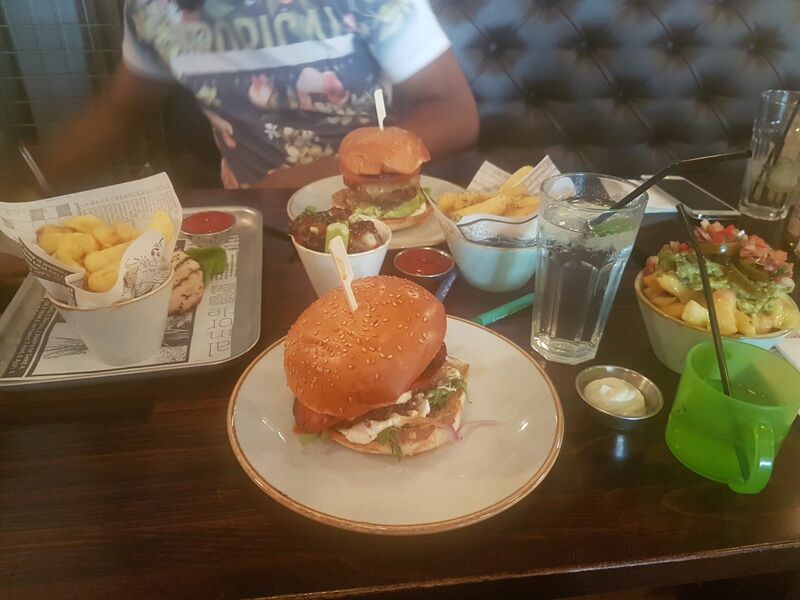 Handmade burger has a massive gluten free menu, it’s just as big as the main menu and comes with loads of different options. Usually there’s only 1 or 2 options for our daughter but there were 5 different gluten free options for her which was great. The wife and I also decided to get gluten-free meals, just in case the toddlers eyes started wondering over to our plates lol. For the little one we ordered the ‘Just Chicken’ meal from the new junior menu. The chicken came with chips, salad and a drink. I ordered a double cheese bacon burger with peri peri chips and the wife got an Italian burger with Mexican chips. We also ordered some chicken wings as a side and Elderflower and lemon and lime refillable drinks. The food at Handmade burger is on point. And the portions are big! You know sometimes you go out and feel like there was no love put into the food? You can just tell when the process has just been followed and no care put into making the food. Well Handmade burger is the opposite, you can tell it’s a family run business. Eleni enjoyed her chicken which had just the right amount of flavour and she also ate chips for the first time ever after rejecting them for ages! There are so many foods she refuses to eat at the mo that she’ll be begging for in a couple of years lol. It was just the right portion size for her and she even had some of the side salad. Our food was really really good and filling. Quick tip; if you are going to eat at handmade burger for dinner, skip lunch! But seriously, the food is really flavoursome and wholesome, much better than some of the factory like meals you might get at different high street chains. 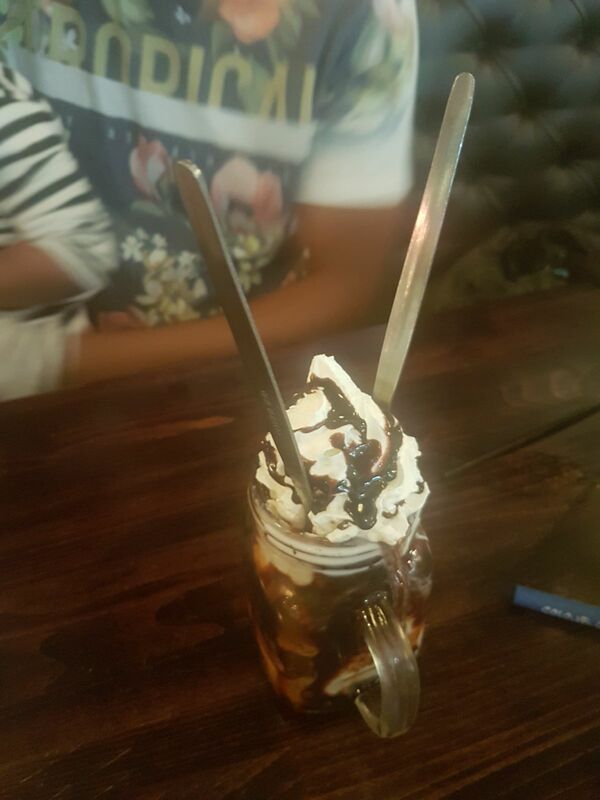 For desert we had the YUMMY Brownie & Waffle and Eleni had some dairy free ice-cream. Overall the experience was really nice. the staff are very friendly and it’s super family friendly with clean baby changing facilities, crayons and balloons for the little ones. 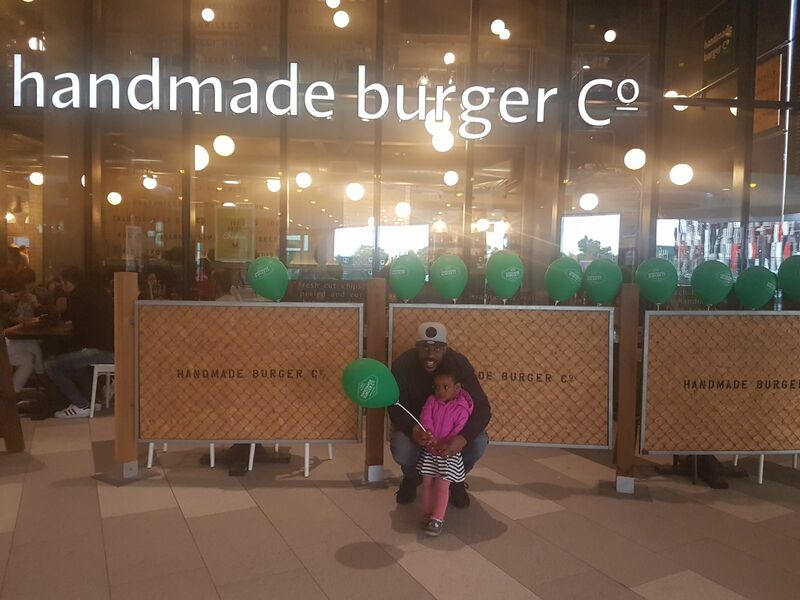 There are 29 Handmade burger branches across the UK, have a look to see if there’s one near you on their website. Tell them MFF sent you!